With the tens of thousands of extreme metal bands throughout the world vying for attention, and most of these staking claim on the often-tried and ever-trve topics of Satan and related ephemera, the added difficulty of garnering interest by means of subject matter, as well as the ongoing need to do so by music itself, cannot be often overcome by those trying their hands at black/death art. Where many fail, Ellorsith succeed, taking as their lyrical focus the Dyatlov Pass Incident, in which nine skiing hikers perished under “mysterious” circumstances forty-five years ago (read more about that here: http://www.dailymail.co.uk/news/article-2401175/Dyatlov-Pass-Indicent-slaughtered-hikers-Siberias-Death-Mountain-1959.html). 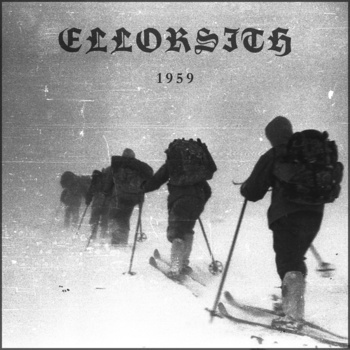 Ellorsith do justice to their chosen concept with a black/death evocation of cold and loss, with disharmonic, openly strummed riffs providing the perfect backdrop for sound-based hallucinations of negative temperatures and frozen extremities. Occasional palm-mutes break up the swarming blizzard of riffs so that the listener never falls prey to a drooling drone, and surprisingly tasteful, forlorn leadwork capture the despair of the doomed students as they come face-to-face with their killer/killers, natural and unnatural alike. Augmenting the atmosphere is 1959’s perfectly-wrought lofi production, skilled drumwork and bending basslines of pure death. And all the while, the Yeti death-bark of this Scotland, UK quartet’s vocalist relates the intriguing story through four tracks (five counting the appropriately disquieting intro) across varying tempo and tides of terror, interspersed by a choir chant and the creeping, crying words of some arcane priest which pepper Ellorsith’s frozen admonitions of sound with a dissemination of Russian supernatural legend. This entry was posted on October 8, 2014 at 6:37 pm and is filed under ALL REVIEWS, E-reviews.You can follow any responses to this entry through the RSS 2.0 feed.You can leave a response, or trackback from your own site.